I'm getting ready for my observation tomorrow - eek! I'm using the book "Snowmen at Christmas" by Caralyn Buehner, and while my story companion is not quite ready yet for TpT (still tying up some loose ends, final touches, etc! ), I wanted to share my sequencing cards! I'm using a Snowman that I grabbed at the Target dollar spot yesterday for - you guessed it - a dollar! I slapped some velcro down the poor things face and stomach, and added these snowflake post-its with transition words for sequencing (post-its also from Target dollar spot - woot woot!). I snapped some pics of the book with my phone, then put them into powerpoint to be printed and laminated. 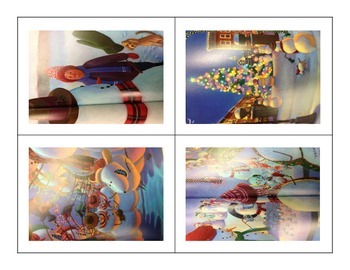 I plan on reusing the snowman for sequencing other activities, so I'll be using velcro on the pictures as well! Hopefully the kiddos find the Snowman as hilarious as I do, and my observation is a success! You can download my sequencing cards for FREE - click HERE.